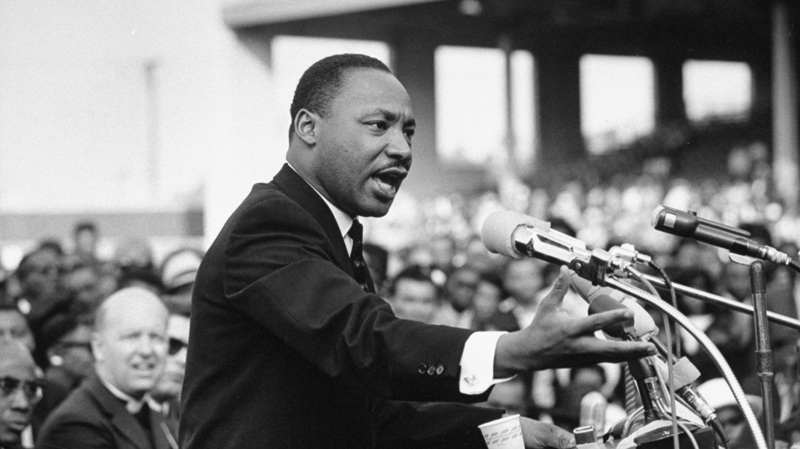 Martin Luther King Jr. Day: Civil Rights leader Dr. Martin Luther King, Jr., born in Atlanta, Georgia, in 1929, never backed down in his stand against racism. He dedicated his life to achieving equality and justice for all Americans of all colors. 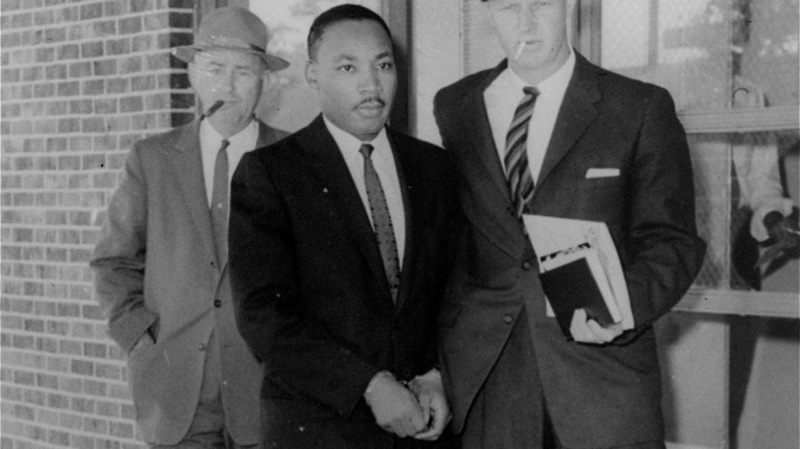 King believed that peaceful refusal to obey unjust law was the best way to bring about social change. 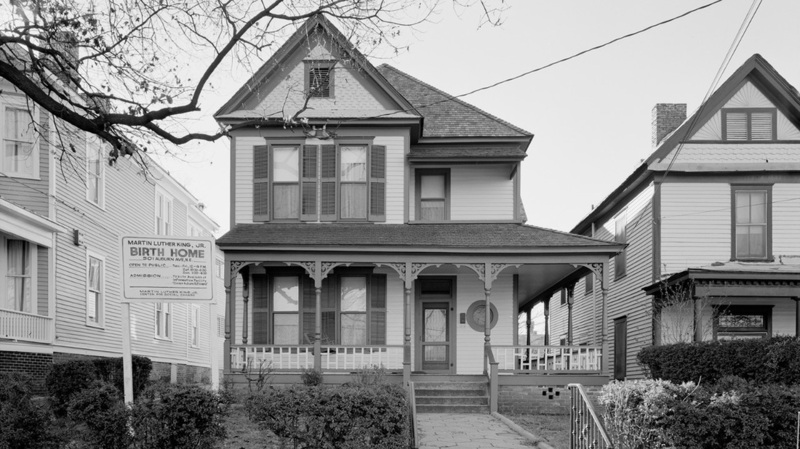 Dr. Martin Luther King, Jr.'s birth home still stands in Atlanta, Georgia. King experienced racial prejudice early in life. Segregation was both law and custom in the South and other parts of America. 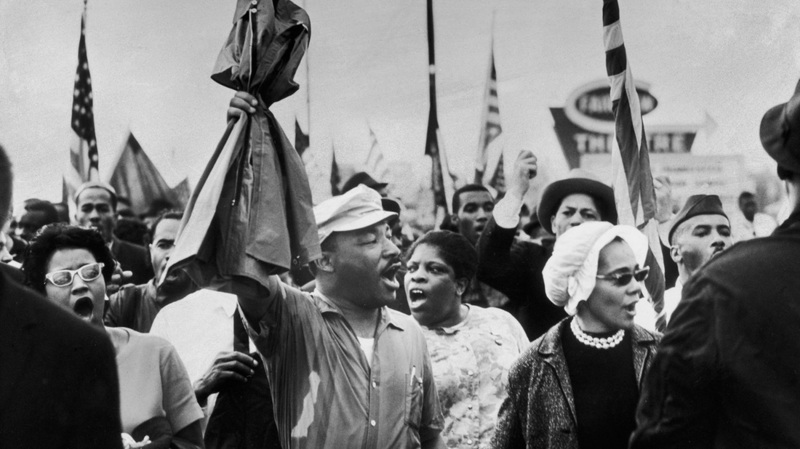 Dr. Martin Luther King, Jr. and wife Coretta Scott King lead demonstrators on the fourth day of their march from Selma to Montgomery, Alabama. King was arrested several times during his lifetime. In 1960, he joined black college students in a sit-in at a segregated lunch counter. Presidential candidate John F. Kennedy interceded to have King released from jail, an action that is credited with helping Kennedy to be elected President. Dr. Martin Luther King, Jr. speaks to a large crowd. King, raised in a family of well-off preachers, is considered one of the greatest speakers in American history. Dr. Martin Luther King, Jr. waves to supporters from the steps of the Lincoln Memorial in Washington, D.C. during the "March on Washington." 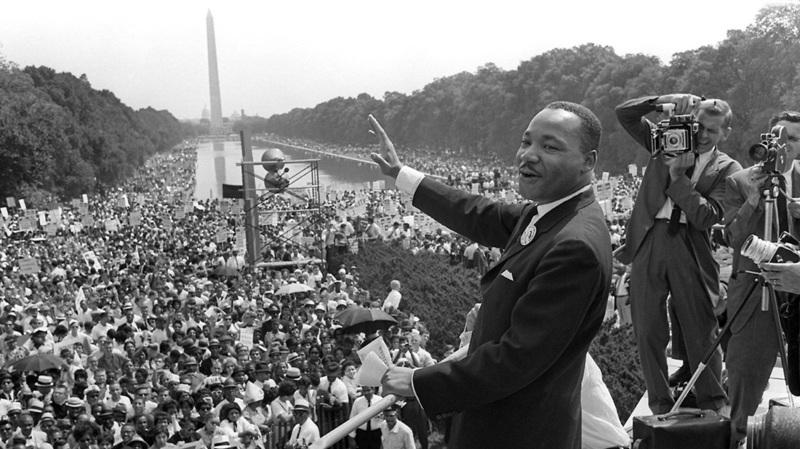 There, he delivered the "I Have a Dream" speech, which boosted public support for civil rights. 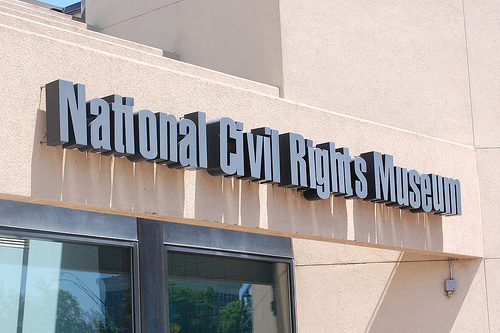 In 1964, Congress passed the Civil Rights Act, which outlawed racial segregation in publicly-owned facilities. 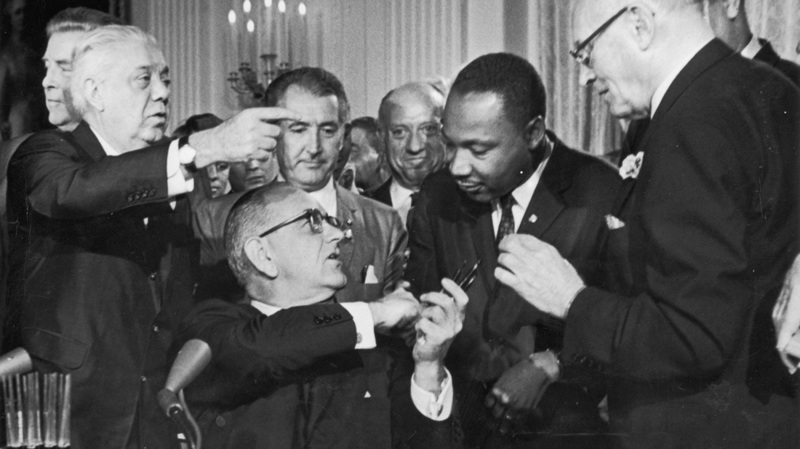 Here, President Lyndon B. Johnson shakes the hand of Dr. Martin Luther King, Jr. at the signing of the landmark piece of legislation. 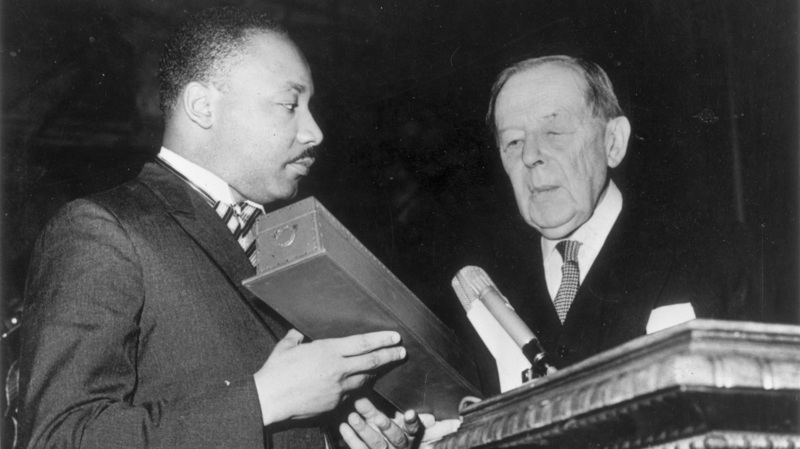 Dr. Martin Luther King, Jr. received the Nobel Prize for Peace from Gunnar Jahn, president of the Nobel Prize Committee, in Oslo on December 10, 1964. 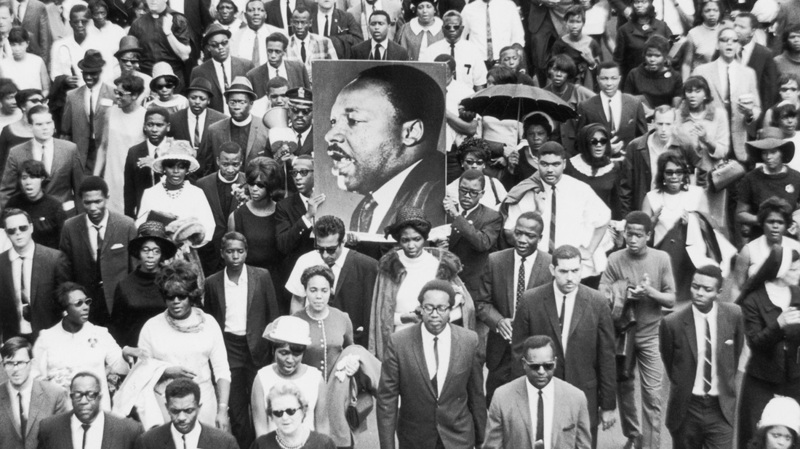 A large crowd of mourners follow the casket of Dr. Martin Luther King, Jr. through the streets of Atlanta, Georgia. 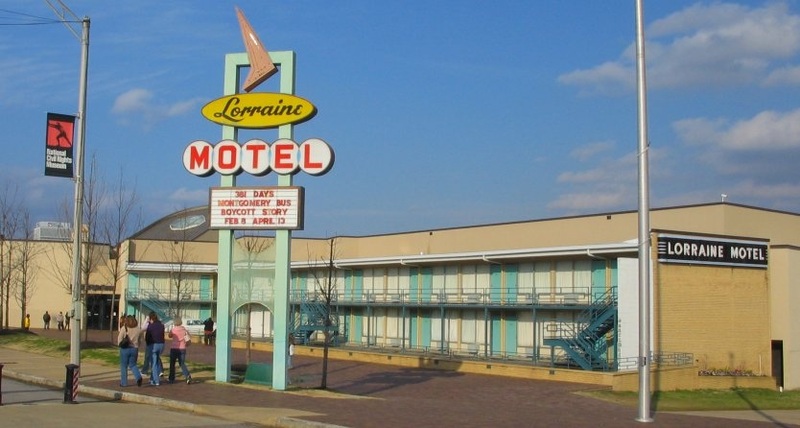 King was assassinated by James Earl Ray on April 4, 1968 on the balcony of the Lorraine Motel in Memphis, Tennessee. Americans honor the civil rights activist on the third Monday of January each year, Martin Luther King, Jr. Day.